In our previous blog ‘Brownfield development – Plan for the future’ we identified how developers can mitigate the risks of brownfield development by planning thoroughly and ensuring all risk factors have been identified prior to construction starting. Over the coming weeks, we’ll go into more detail on the study, survey, geophysics and site investigation techniques that we can use to help uncover the potential risk factors lying beneath the surface of a brownfield development site. This week we’re looking at desktop studies and topographical surveys and utility mapping. Desktop studies usually form the basis for an ongoing assessment strategy for the site, to satisfy environmental due diligence requirements. Undertaking a review of published historical, hydrological, geological and environmental information prior to a site visit helps determine the underlying geology, the historic land-use and environmental constraints associated with any site. A GIS approach can be used to overlay historic map data, determining exact areas where disturbance has taken place and made ground should exist. Identifying this information helps inform your site investigation strategy and provide a suggestion of the possible hazards and complicating factors that might be expected on a site. The strength of GIS is that it can also combine all of the data from the later stages of surveying, so that a complex dynamic site model can be maintained as the site investigation develops. With the increasing ease of access to OS mapping through online portals such as the OS Mastermap, it is reasonable to ask why more accurate mapping is required after desktop studies. And, for some projects which are not likely to progress beyond Stage 1 for an initial period, OS data may be sufficient. For anything else however, detailed and accurate information from the ground will be integral to the success of any project. 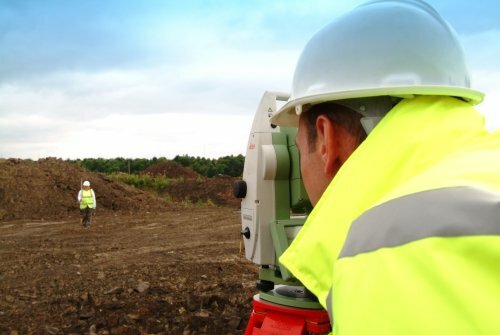 Undertaking a topographical survey will provide you with an accurate base plan and levels across the site. These can be used for modelling site topography and hydrology as well as forming the foundation of any design requiring a geospatial element. Met surveyors undertaking a topographical survey to provide an accurate base plan and levels across the site. Utility mapping will determine the presence and route of utilities crossing the site. Not only is this a legal requirement before breaking ground, but producing an accurate map of the utility infrastructure during the survey stage will help you determine what needs to be avoided, removed, diverted or re-used once construction begins. It is also important to remember that damaged pipes and ducts may act as contaminant pathways, transporting contaminated groundwater and solutions from the site itself to other locations and possibly into the public networks, so an accurate plan of these networks is vital in order to establish the risks that may exist. If you’d like more information on our Brownfield site investigation services, contact us on 0113 200 8900 or complete the contact form on our website. Next week we’ll look at geophysical brownfield reconnaissance and non-intrusive site investigation.